Love both the leop print dresses, great picks! Dresses are my go-to for any season/occasion. This is a great guide and I love your picks! I am excited to see so many prints–I think they make an outfit much more interesting + unique. Thanks for sharing! Great dresses! I like the Dolce Vita dress! This makes me want to buy dresses and only dresses! They are gorgeous. The red cocktail dress is beautiful—it reminds me of a flamenco dancer’s hem. I really like how clean your collages look. Are the pictures all from Shopbop? So many fabulous options! Loving the Valentino RED options and the MSGM pink and red! I’m obsessed with your cocktail dress picks. I may need either of those RED Valentino ones for an upcoming wedding…I mean, I really wanted a pink dress but I just can’t help being drawn to black. merritt– such good picks. i am now dying for that club monaco dress- so awesome. I love DVF wrap dresses as well – they’re so versatile! 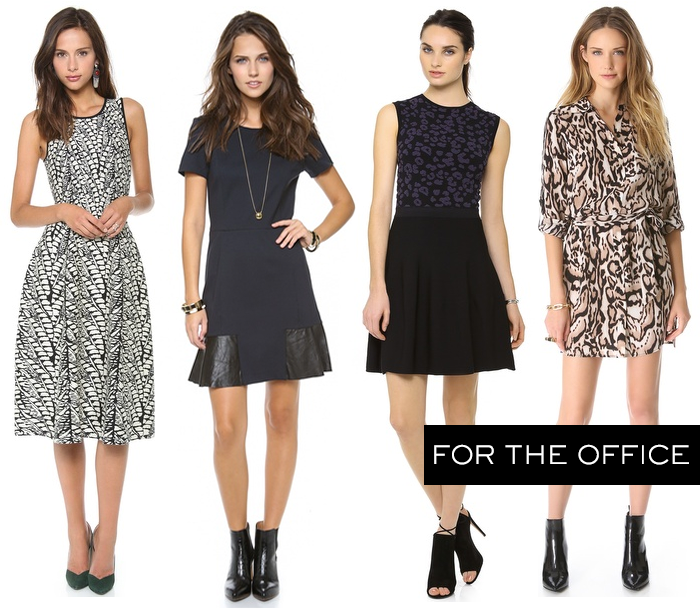 The printed DVF dress looks like such an easy option for fall and the cocktail dresses are all so cute!! I seriously want all of these! Such great picks!